Like all great stories, Dami Im’s life sounds a lot like a fairy tale. There’s a certain amount of struggle, a determination to succeed and then the joys that success itself eventually brings. Selected as Australia’s entrant in the 2016 Eurovision Song Contest, Dami joins an elite list of Australian performers who have previously represented their country including Guy Sebastian and Jessica Mauboy. In 2013, Australian TV audiences witnessed the astonishing transformation of Queenslander, Dami Im. As her X Factor mentor Dannii Minogue noted, “She looked like she stumbled on stage by accident”. From a shy awkward ingénue, Dami Im blossomed into a powerhouse vocal star, and first-rate performer on The X Factor 2013. The shy girl in the corner took centre-stage and brought the house down, deservedly winning the show convincingly. Of South Korean descent, Dami moved to Australia with her family when she was nine years old. Whilst she calls herself a proud Australian/Korean these days, life in a new country struggling to find where she fitted in wasn’t always easy. That sense of humility is always with her, but the music she brings is meant for the world. Buckle up Eurovision, Australia’s entrant for 2016, Dami Im, has arrived! 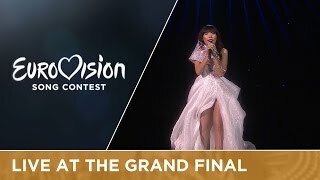 Dami Im performed ‘Sound Of Silence’ at the Eurovision Song Context in May, 2016 and placed Second.